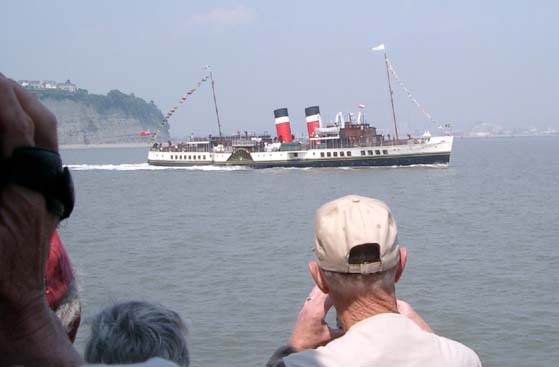 Wednesday 26 May was bright but misty as we stood on Clevedon Pier to await the Balmoral's arrival from Bristol. Departure time came and went without a sight of her but we were reassured she was on her way by Nigel Coombes who had seen her sail away from the Cumberland Basin. 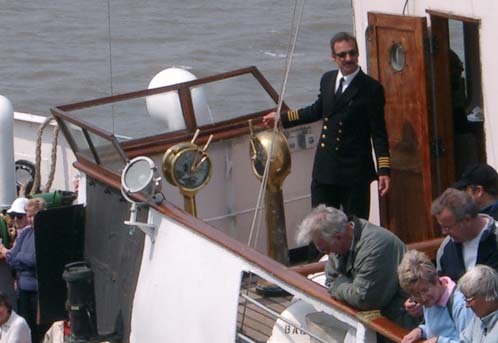 He had, along with the crew and other volunteers, been working late into the previous evening to get the ship ready for sea after the major work over the winter. 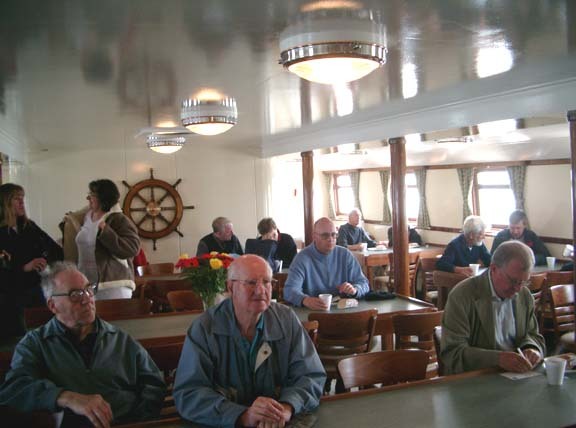 An innovation this year are the Latvian stewards and Polish deck crew, who all speak English. They are hard working and smart. Then she appeared round the headland to a round of applause and a cheer. But this may have been a coincidence as a fishing rod, inadvertently dropped from the Pier by an angler, was recovered at the same moment! There is a new escape from the lower deck and a ship's wheel adorns the casing. 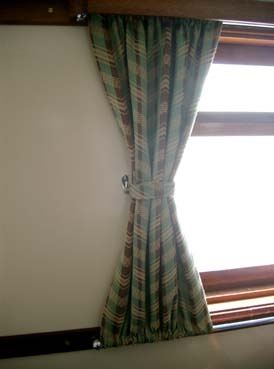 The modern idiom servery is behind this. The tables come from the hands of Tony Horn. 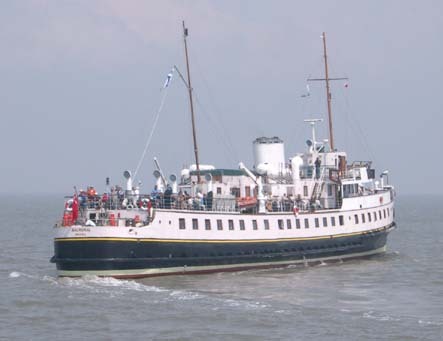 The day's salings incorporated travel on the Company's two ships. 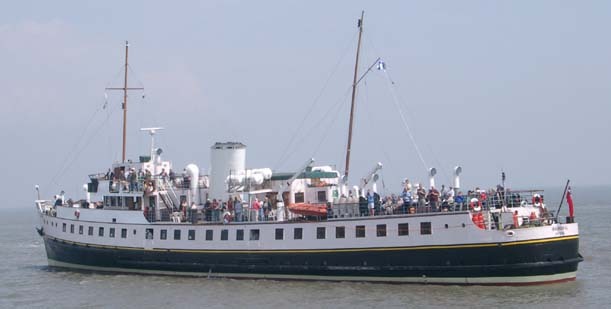 While the motor ship had made her way to Penarth from Bristol and Clevedon, the paddler had steamed east from Swansea and Porthcawl. 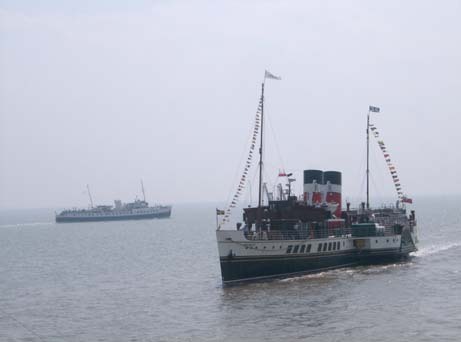 This was our first glimpse of the Waverley. 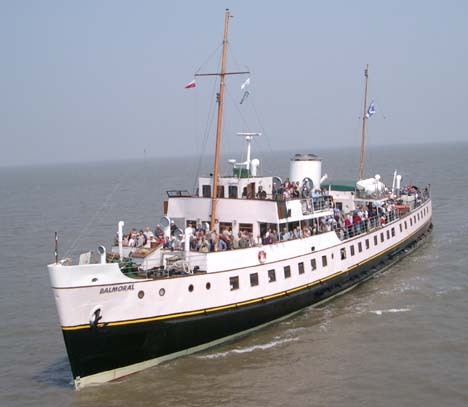 All passengers had to change ships at Penarth as the Waverley was to continue to Clevedon and the Balmoral to Swansea. The paddler had dropped off her passengers before we got there and came in for her second call as the Bal circled. 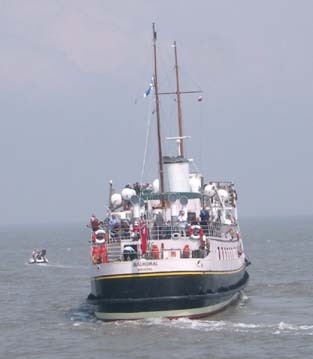 The motor ship heading back to Penarth Pier at the conclusion of the joint sail. 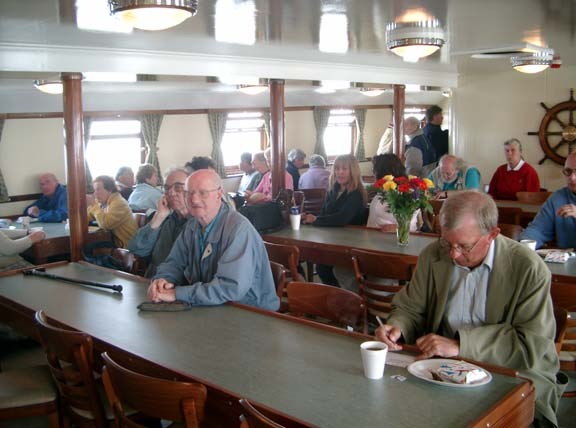 The two ships then parted company and are not scheduled to meet again this year.